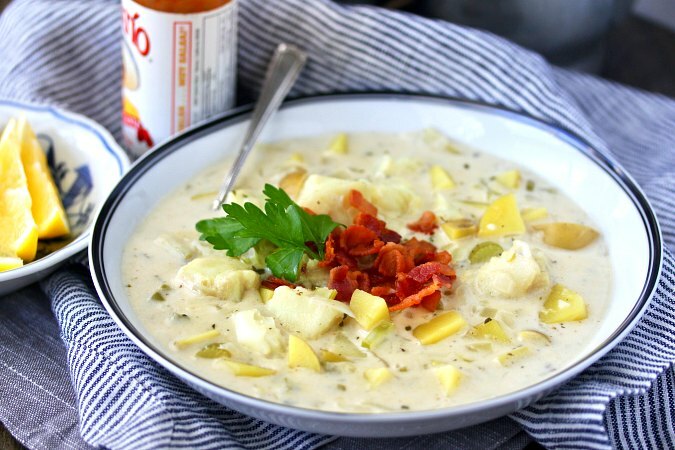 This Cod Chowder with Bacon, loaded with Yukon gold potatoes and a bite-sized pieces of cod, will warm you up and fill your tummy on a snowy day. I live in the Los Angeles area where snow is really rare, as in almost never. However, we have just had a whole week of rain and temperatures in the 50s (also known as "freezing" around here)! This gave everyone a chance to break out cool rain boots, beanies, and pretty wool scarves, and pile our beds with lots of blankets. Fortunately, we didn't have any significant mudslides or flooding after this week of rain, and the temperatures next week will be in the 70s. No one complained as we needed the rain. However, this weather called for soup that is comforting and warms you up. Enter this cod chowder! This cod chowder was killer good, as in "do I really have to share it?" good. One of the reasons is that I used the leftover shrimp stock that I had frozen after making this herb and wine poached shrimp cocktail. One of my favorite secret ingredients is shrimp stock. It is so flavorful. Whenever I make a shrimp dish, I freeze the shells to make stock later. It is so worth it. This is a photo of the defrosting shrimp stock. It's gold!! 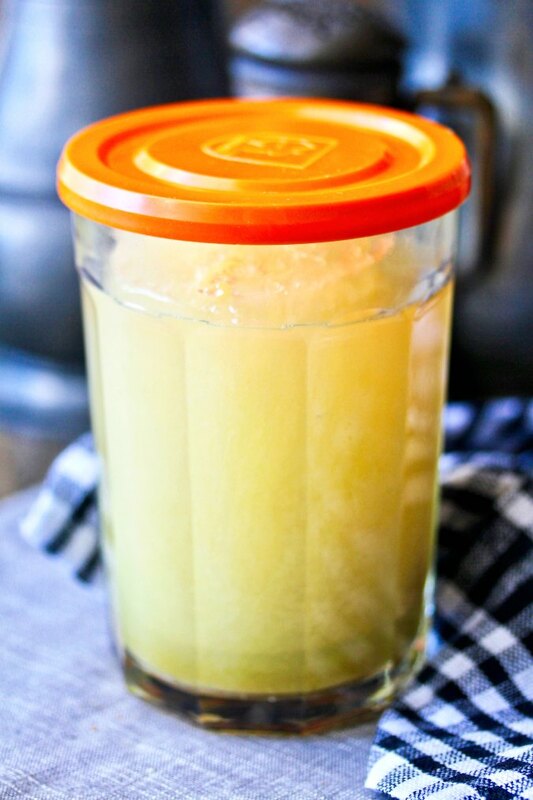 If you don't have shrimp stock, you can substitute bottled clam juice. You will still have a delicious, creamy, and briny broth. 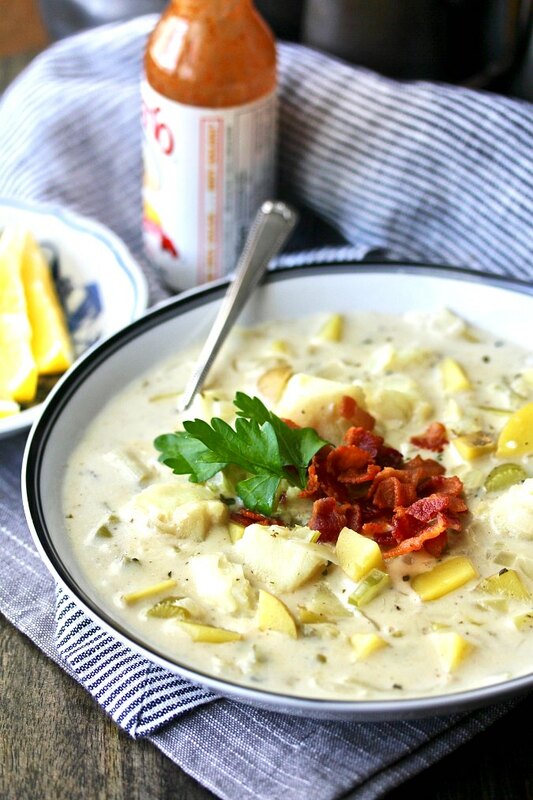 How do you make this cod chowder? First, you fry the bacon to render the drippings and brown the bacon. Next you sweat some onions, celery, and garlic in the bacon drippings (and some butter) and then create a roux with some flour. Add some wine and deglaze the pan, and then add the shrimp stock or clam juice, potatoes, and herbs. Once the potatoes are just about cooked through, add some milk and cream, seasonings, and the cod. Add some lemon juice as a final touch and serve garnished with the bacon and some parsley. Leftovers of this soup hold up really nicely. This is a hearty and delicious chowder and will be on regular rotation in our house. 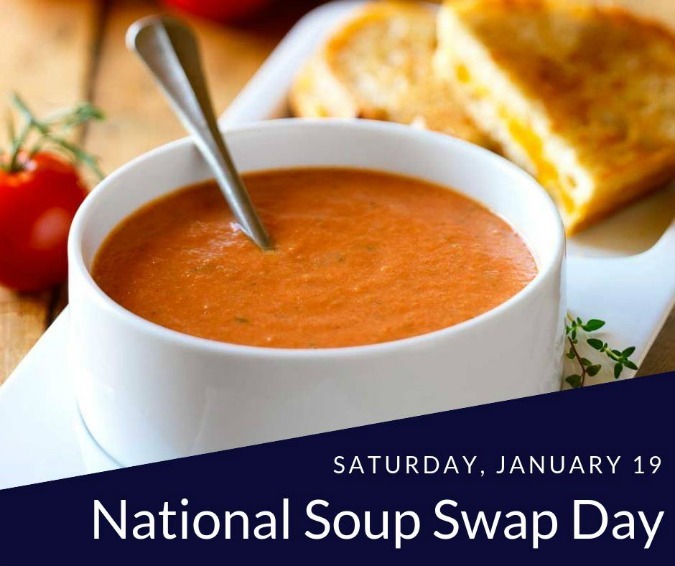 Today is National Soup Swap Day. Who knew? Kate's Recipe Box is hosting a round up of soups to celebrate. This "holiday" also coincides with Soup Saturday Swappers, hosted this month by Palatable Pastime. What does this mean? Double soup for you!! Cook the bacon in a large Dutch oven or saucepan until crispy. Transfer the bacon to a paper towel lined plate and remove all but 2 tablespoons of the bacon fat from the pan. Add the butter to the bacon fat in the pan and heat over medium heat. Add the onions, celery, and garlic. Cook, covered, for seven minutes, until softened. Add the flour, and cook, stirring constantly, for about 3 minutes. Add the wine and deglaze the pan. Cook for about 3 minutes. Add the shrimp stock (or clam juice), diced potatoes, thyme, and bay leaf. Bring the mixture to a boil and reduce to medium low and simmer for 15 minutes. Add the milk, cream, salt, pepper, hot sauce, and Worcestershire sauce. Return the pot to a simmer and add the cod. Simmer for about 7 minutes until the cod is cooked through. Stir in the lemon juice. Serve topped with the bacon and parsley. I am in line with my bowl! Your cod chowder looks perfect! This looks really perfect! We have a storm this weekend with "blizzard-like conditions" expected, so this would be a delicious and warming meal! I'm a big fan of fish chowders. I've used clam juice but I eat enough shrimp to make stock. Great idea! Thanks! It was a revelation. This sounds delicious! I love the layers of flavor you've created in the soup. Thanks for linking up to the Celebrate 365 Soup Swap! It amazes me who very much we are on the same page all the time. I've been looking at cod chowder as I have leftover cod in the freezer from Fish Friday Foodies. I think this is the best recipe I've seen. Thanks. Thanks Wendy. Great minds! I am pretty sure you will love this soup. I really didn't want to share. This sounds yummy and looks amazing. I love the creaminess of the soup. I bet the bacon adds an amazing flavor to this! It does, but the stock was the best part. That crispy bacon has me swooning! And yes, shrimp stock IS gold! Yum! Shrimp stock and bacon, the best combo. I love these photos! I love seafood and soup together, so this is perfect! And the bacon is just the perfect touch. 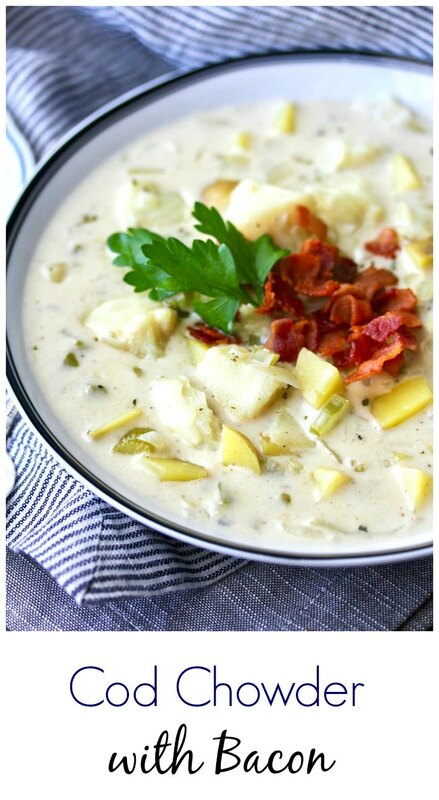 My husband is a huge fan of chowder, and adding bacon makes it even better! I love chowder and this looks so good! This sounds delicious and filling.